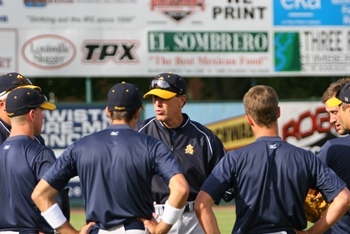 article written by Sam Riggleman, head coach, Spring Arbor Univ. Championship teams demonstrate a toughness that separates them from many of their opponents. It is apparent the “collective mind-set” of these teams is grounded in some very specific principles. These teams have identified the factors necessary for dealing with pressure. Peak performance under difficult, adverse and pressure packed situations is the ultimate demonstration of championship toughness. So….how can players be better educated and prepared to handle pressure situations? Is there an application beyond the baseball field? I would encourage you to consider the following seven themes that impact performance on the baseball field and ultimately in our spiritual development. One positive, functional directive can change a performance. The thought pattern of players is critical to their success. The apostle Paul encourages us to “take captive every thought to the obedience of Christ” (2 Corinthians 10:5). Our thought life matters. Complete commitment, total dedication and steadfast resolve are qualities necessary to dominate your area of performance. The same is true with your area of influence. Faith, moral excellence, knowledge, perseverance and godliness are attributes which should dominate your life as a follower of Christ (II Peter 1:5-6). Remember, someone wins every single pitch of a baseball game. The ability to recover immediately, when things go bad, is essential to high-level performance. Those who have a “default system” survive and move on to the next pitch. So…do you have a spiritual default system in place to handle the disappointments and uncertainties of life?